Leave the digital SLR camera at home. 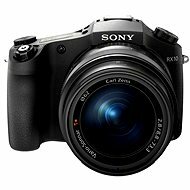 This new compact RX10 camera is reliable in any situation. It features a 20.2Mpx Exmor R CMOS type 1.0 advanced aspherical sensor and a high-quality Carl Zeiss Vario-Sonnar T lens with a constant aperture of f/2.8 and a zoom range of 24-200mm. With every press of the button, you will have perfectly clear and detailed images. The Exmor R CMOS sensor type 1.0 with a resolution of 20.2Mpx and advanced aspherical lens technology offers the same detailed results as the well-known RX100 II model. In addition to that, the new BIONZ X image processor reduces noise levels in specific areas and creates bright realistic images with high resolution. Share photos anytime and anywhere. Now there is an easier way with the creative one-touch NFC technology. With just one touch, you can share photos and videos without complicated cables and connectors. Use the built-in Wi-Fi technology and connect to a computer, TV or any other device. Smoothly record videos in AVCHD format in Full HD at the touch of a button. Adjust the focus and exposure while recording at a high rate. The sensitive Exmor R CMOS sensor with a resolution of 20.2Mpx along with the new BIONZ X processor create images with precise detail and minimal noise, even when recording in darker places. Everything you need is now in your hands. The manual focusing ring on the smooth-motion lens lets you precisely adjust the focus and zoom. You can easily adjust the exposure with the aperture ring. Difficult shots are now simple - the light and durable magnesium alloy body is even resistant to dust and drops of water. Strap, USB cable, Manual, Lens cap Done! 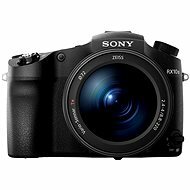 For shipping to other EU countries visit this page SONY DSC-RX10. Für Versand nach Deutschland, besuchen Sie bitte SONY DSC-RX10. Chcete doručit zboží do Česka? Prohlédněte si SONY DSC-RX10. Chcete doručiť tovar na Slovensko? Prezrite si SONY DSC-RX10. Magyarországra történő kiszállításért tekintse meg ezt a termékoldalt: SONY DSC-RX10.